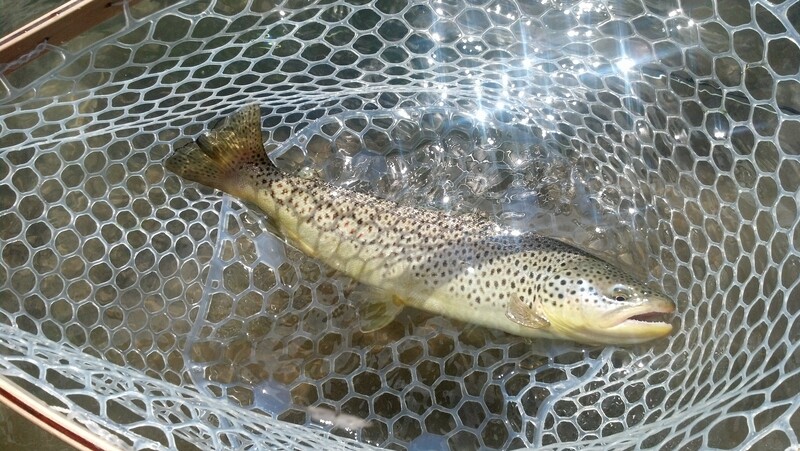 This entry was posted in Fly News and tagged Beginner fly fishing Fly Shops freshwater flies indicators Learning to Fly Fish Monthly Fly monthly fly box nets nippers Nymphing spring trout fly fishing summertime trout fly fishing waders wading boots on March 23, 2016 by Joe. The fish don’t care what rod or reel you’re using. The fish don’t care what brand your waders are. The fish don’t care if your waders “match” your boots. Gear is probably the single most intimidating factor when it comes to fly fishing. You watch these guys on YouTube and TV and see all the boxes of flies and fancy vests they’re wearing. Then you walk into a fly shop or go online and see all the different types of gear and all you see are dollar signs $$$$$$. As a beginner or intermediate fly fisherman, you do not need to go out and spend a mortgage payment just to get outfitted for fly fishing. No matter what your budget is, there is an outfit for you. 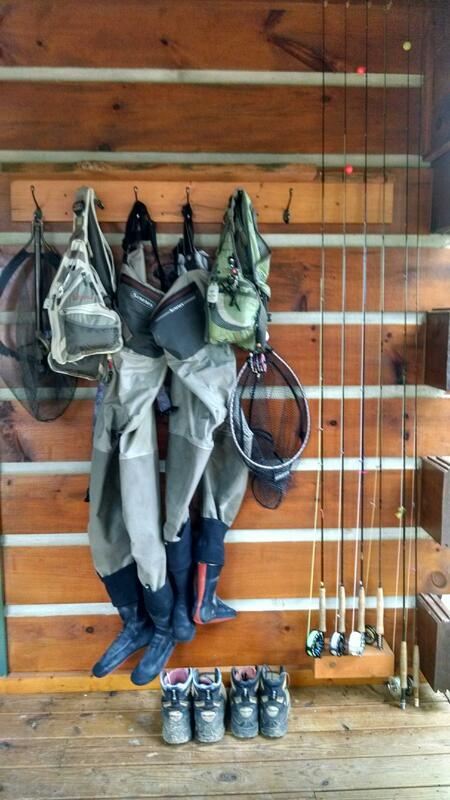 Most big box store will sell a bargain outfit, with both a rod and reel, to get you started. The fish don’t care if they’re caught on a $100 rod or a $1,000 rod. 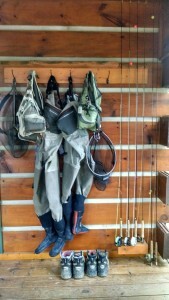 I remember my dad getting me a 4-weight, 7’-6” Dogwood Canyon rod and reel from Bass Pro Shop. It was my first fly fishing outfit. I fished that rod for years and still have it 12 years later. 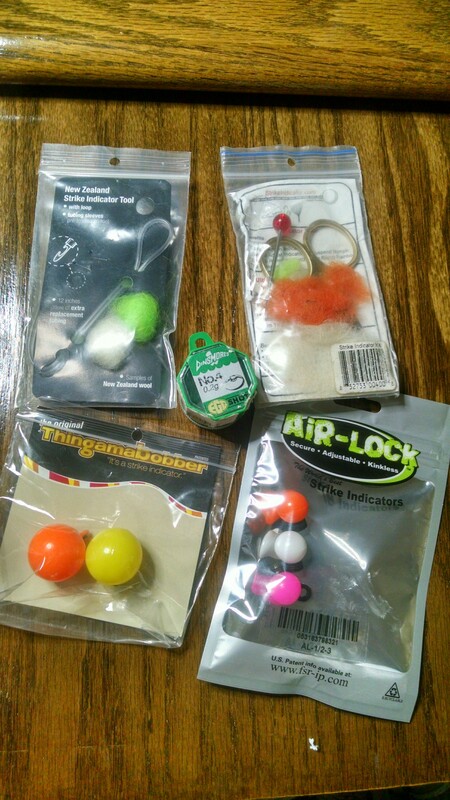 Ultimately, you need something to throw line. Sure, the more pricey rods will advertise how well they throw and how light they are. No matter what rod you end up with, you have to practice with your rod. Once you become proficient, you will be fine. You might need a little more “oomf” and it may take a little more practice with the less expensive rods. You might build up a little more strength in your arm with a slightly heavier rod (added bonus, right?). I recommend a basic rod to start with in the east is a 5-weight rod. Out west you might be looking at a 6 or 7-weight if you are fishing areas where there are stronger winds. A 9 foot rod will fish most of the waters. If you are fishing really small streams then a 7’-6” foot rod might serve you well. 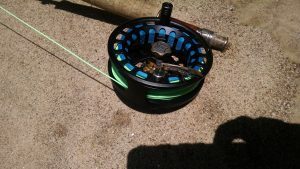 Your reel needs to hold your fly line and help you reel in a fish. The less expensive reels typically weigh a little more and may have less aesthetic designs. Again, the fish don’t care what your reel looks like. The more expensive reels typically have better quality drag systems. With saltwater fishing, the quality of the drag becomes more important. However, in most freshwater applications, an inexpensive reel will suit your needs just fine. You’ll just need to keep it clean and oiled. The weight of your fly line needs to match your rod and reel. Just like the fly rods, there is a wide price range when it comes to fly line. The biggest hurdle is determining the type of line you need: floating, intermediate, sinking tip, etc. 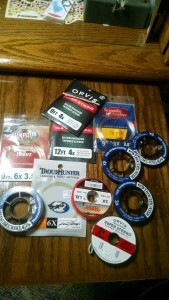 My fly line of choice is a weight forward floating trout line. Similar to the discussion on fly rods, all fly line will throw. Sure, some may feel like it glides through the eyes better and some may feel like it floats or sinks or mends better. You just need to practice with whatever rig you purchase. Some of the less expensive lines may collect dirt and grime a little more quickly than their more expensive counterparts. It is simple enough to clean you fly line from time to time. Another inexpensive trick is to add a little floatant to your fly line if it isn’t wanting to float as well as you’d like. There are so many different types of flies and fly boxes out on the market. When it comes to flies your best bet is to learn hatch charts, go into a shop and talk to some outfitters about what is working or order some online from a company that matches the hatch in your area. As for fly boxes there are a ton. 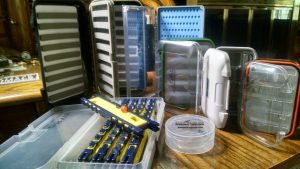 You do not need to spend top dollar on a fly box to be able to fish better. A cheaper box that holds flies is all you need. I would advise getting a box that is rated as “waterproof” (I have found very few boxes that are said to be waterproof truly are) These are good especially for a beginner because it is not a matter of if, but a matter of when, you will take a fall and get wet. Flies are not cheap, so it’s best to protect them as well as you can. If you don’t spring for the waterproof box initially, just be sure to pull all of your flies out of your box to dry after taking an “unintended swim”. There are many choices for tippets and leaders and they will all catch fish. The two largest differences are monofilament (mono) or fluorocarbon. I could write an entire article on the two, but will save that for another day. Fluorocarbon leader material is more expensive than monofilament. Fluorocarbon leaders and tippet are more dense than mono so it will help your nymphs get down faster. The fluorocarbon is refractive, making it less visible in fresh water. Fluorocarbon is generally more abrasive resistant than monofilament and does not absorb water or prone to break down by U.V. light. Personally, I choose fluorocarbon as my nymphing tippet/leader material. I will use monofilament leader/tippet material for dry fly fishing. .When I started fishing I used straight mono and still caught fish. My wife, even though she knows the difference, still uses monofilament. If you’re starting out and on a budget, there’s nothing wrong with monofilament for your leaders or tippet..
Now that I have explained the difference in in leader and tippet material, let’s talk about length and what size to get. 99% of my leaders are 9 foot in length. If you want longer you can always build out your leader using tippet material. This saves you from buying leaders in all different lengths. I usually start off with a 4x or 5x leader. If I build it out from there I will go from 5x to 6x – on step down. 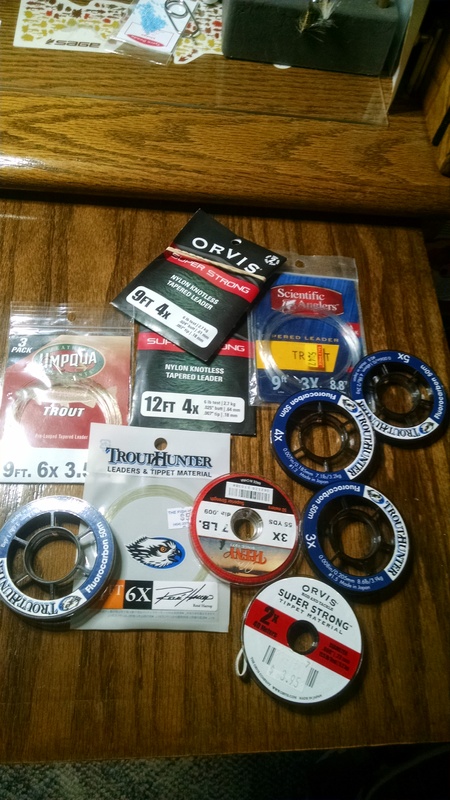 For freshwater fishing, you can probably start with spools of 4x, 5x, and 6x tippet. In some climates, you may be able to get by wet wading and skip the waders. 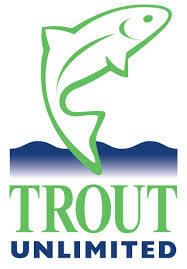 However, for many of us, the trout prefer nice cold runs and waders provide some insulation from the cold water. If you read any articles on the the “best” fly fishing gear, you can easily drop $500 on a pair of waders. Do you “need” those $500 waders? Probably not. To get started, you can pick up a pair of neoprene waders from most sporting goods or big-box stores. They’ll keep you dry and serve the purpose. One of the major gains as you spend more is comfort. The more expensive waders will have molded booties for your feet and various sizes for the booties. This comfort can allow you to stay in the water longer. The more expensive waders will generally hold up longer and are more durable if you’re hiking through brush and briars (and perhaps through a barbed-wire fence). However, you can buy numerous replacement pairs of $60 neoprene waders before you ever total $500. Again, if you’re starting out, you don’t need to start with the $500 pair of waders. If you enjoy it and know that you want to stick with it, you may want to upgrade in the future. For the women, I have an additional note. Most (if not all) of the inexpensive neoprene waders are sized for men. It is more than likely that to get the waders to fit half-way decent, the booties will be way too big. This results in a bunch of neoprene wadded up by your toes. You will need your boots to be big enough to accommodate all of this excess neoprene. 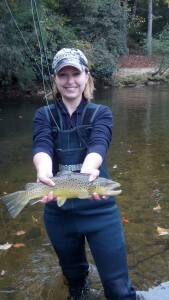 If there is only one splurge in your initial outfitting, I would recommend finding waders that come in a women’s fit. You can still buy the most inexpensive pair of women’s waders. Similar to waders, the primary difference in wading boots is comfort and durability. You can start with an inexpensive pair of boots to get the job done, then upgrade later. I would suggest that you find the most comfortable pair of wading boots your budget will allow. Remember to size them up at least 1 size from your normal footwear. It is recommended to try them on with your waders and thick socks for a better fit. Having the right net is critical to proper fish handling, especially if trout fishing. The mesh of the net needs to be rubber or rubber-coated. The more-expensive nets are typically a 100% rubber mesh that can be replaced. Less expensive nets are rubber-coated string nets. Generally, once the net material wears out, the net cannot be replaced like their more expensive counterparts. These less expensive nets do the trick. Another benefit to not tying up a bunch of money in a net is in the event it floats away. From experience, I’ve lost a net or two. The real question is will it get worn out or float away first. There are a few small items that might make life a little easier on the water. There are a couple of must-haves that you will want to start with. After that, you can add to your collection here and there. You need a pair of forceps to help with removing hooks once you’ve caught fish. You can pick up a cheaper pair online for a couple of bucks. 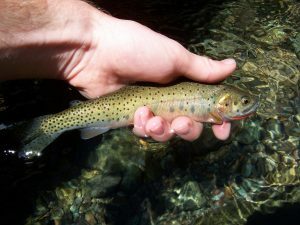 More costly forceps will run $10-$20 at a fly fishing shop. The forceps provide a little more finesse than needle-nose pliers, which is important for safe fish handling. 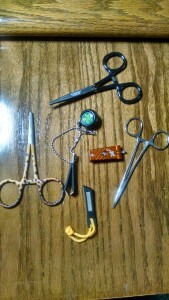 You’ll also want a pair of nippers to trim up excess line from your knots or if you need to cut the line while fishing. 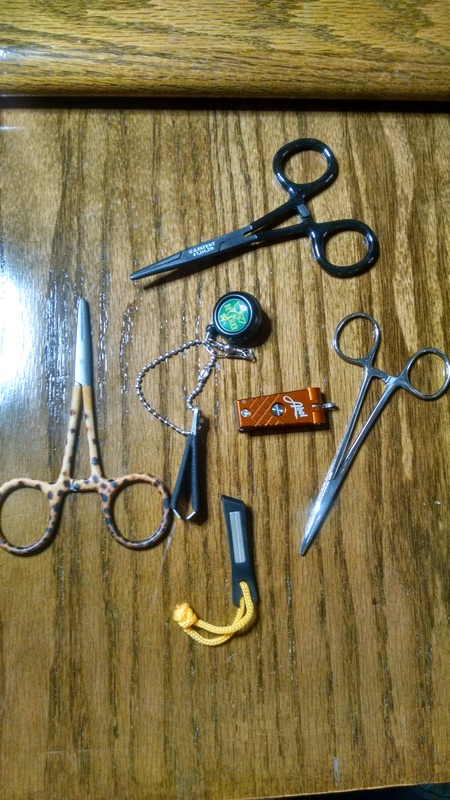 Since most fly fishing leaders and tippet aren’t high poundage lines, a simple pair of nail clippers will work. Even if you spend a little more for fishing nippers, you’re not talking big dollars on this purchase. Lastly, you’ll want some indicators. There are simple plastic and wool indicators. Either will work; they just need to be sized to your flies.There are thousands of fly fishing tools and gizmos, all advertised to make your life better. In reality, you can start with the basics and the evaluate your needs in the future. You’ve probably seen a variety of vests, hip packs, check packs, and sling packs. All are designed to carry gear and most are loaded up. Eventually, you’re going to buy more gadgets and gizmos and you’ll need something to carry it all in. However, starting out, you really don’t need much. 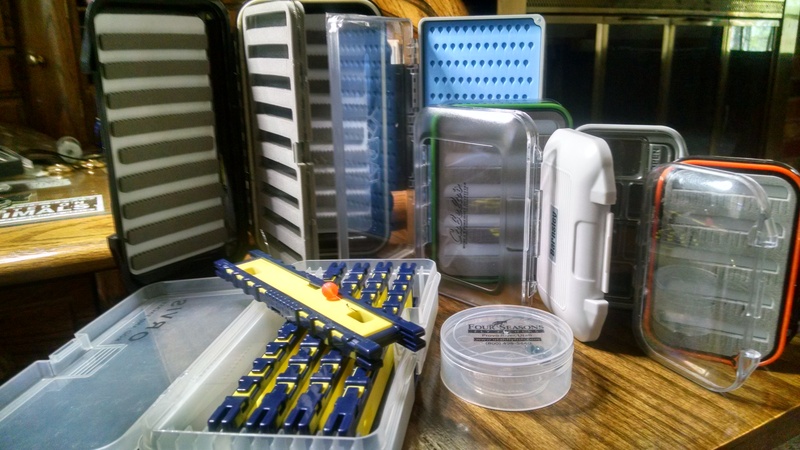 A single fly box can be stuffed in the chest pocket of your waders. I’ve found that forceps and nippers work well on zingers. Other small items can be clipped to a lanyard around your neck or hooked to a D-ring on your waders with a simple carabiner. I would recommend spending some money on a magnet or net retractor. This will help secure your net out of the way on your back when you are not using it. If this is something you do not want to splurge on right now, then attach the net with a carabiner to your wading belt. 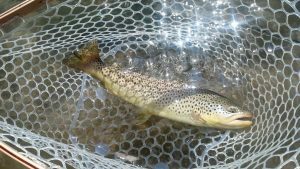 I hope that this can remove some perceived cost barriers for you to get you moving into the fantastic sport of fly fishing. The fish don’t care what rod or reel you’re using nor do they care what brand waders you’re wearing. After some time on the water, you can figure out how you want to organize your gear to make it work better for you. As you spend more time on the water, you can decide when is the right time to upgrade some gear. Not one person’s setup is the same as the next, so there is no right or wrong way to outfit yourself. You can start simple and build from there. The fly fishing industry is booming and there is more gear coming out monthly.